Schroeder has a great post on Francis Heitmeier's interest in everything but levees during his time on the Orleans Levee Board. The key source is an article on Peggy Wilson (rumored candidate for NOLA mayor), who describes her time serving with Heitmeier on the Levee Board. Both Schroeder's post and the Wilson interview piece are crucial reading. The Times-Picayune is on the case again. They won't let the unified levee district story go, and we need sustained attention like that. Today the T-P writes an editorial listing with bold-face type the state legislators who voted against the creation of a unified levee district for our region. Conveniently, the paper also lists my state representative, Jalila Jefferson-Bullock, who didn't even bother to vote. Apparently her education at Harvard and the University of Chicago didn't cover training in virtue. Maybe she was attending a grand jury hearing for her father. Our region needs a levee board focused on levees, not on casinos, an airport, and a police force, as the current Orleans Levee Board spends its time. I'll go even further: we need not only a unified, regional levee board; we need regional government. I'm going to spend some time researching this issue before I really elaborate, but I like the idea of Orleans, northern Jefferson, northern Plaquemines, and St. Bernard all under a single mayor or president. Strange bedfellows make for great politics. I like the idea of a region with Harry Lee as police chief and Oliver Thomas as mayor or president and Junior Rodriguez as, as--oh, we'll find him a job because he's fun to listen to and because he's proven his mettle a hundredfold during this whole mess. The heart-and-soul of our region isn't Uptown (where I live) or Old Metairie or even the Quarter. It's Jefferson (the area near Ochsner, not the parish), Gentilly, Bucktown, Arabi, Chalmette, the Lower Ninth, Belle Chasse, Gretna (yes, even bridge-defending Gretna). Those are the folks who give metro New Orleans much of the character and most of the characters who really make us special. I think a regional government that unifies all that makes sense. The BRA test is the real test of whether an area of metro NOLA is essential to who we are. If in that part of town "bra" refers more often to your buddy than to a woman's support undergarment, then that's a place that deserves special attention. That's who we are. The Quarter and Warehouse District are nice places that we show our guests. They are the formal dining room; the "bra" areas are the kitchen, where the real bidness is done. As Dillyberto (a real bra if there ever was one) says, we need Gentillification, not gentrification. "We want to see them helping themselves before they ask us for help." A Republican congressional aide (unnamed) said this to Time magazine in an interview for their recent November 28 cover story on New Orleans. I'm going to type that sentence again because I need to see it again, and I need everyone to contemplate these words. I'll try to stay calm, but it's not easy. 1. 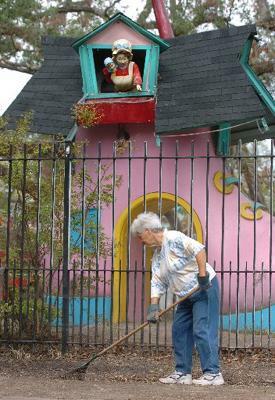 It is quite evident that we New Orleanians and Gulf Coasters want to "help ourselves." Come here and look around--middle-age women pulling out sheetrock, septagenarian men with industrial-strength filter masks on. Yesterday I had six children in my house (my own plus two others) so that a friend could gut his first floor. What he needed more than anything was a place of respite for his kids while he took care of business. It is insulting to assume that we are doing anything but helping ourselves. 2. Why is there a chronological, sequential fixation in this Republican aide's (and many others') mindsets? Why is the thinking, "First, that will happen, THEN this will happen"? Why can't we get our due AS AMERICANS even as we help ourselves? Can't we have more than one level of work going on at once? By the way, I am of course grateful for the extensive publicly-financed cleanup that is still going on. To move forward in a lasting sense, however, we need public (e.g. governmental) backing for creative, hardworking folks to find a way to fix an ecosystem that humanity broke and that now is wreaking havoc on us on the Gulf Coast. 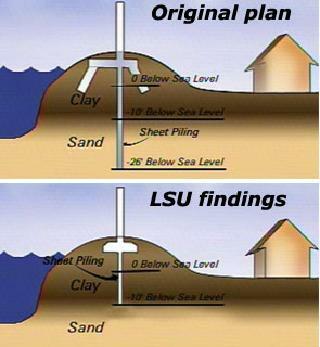 Mark my words: New Orleans's plight is a straw in the wind for the rest of the country. What you see here is coming soon to a theater near you. 3. Did you hear anything like these cynical Republican words coming out of the mouths of folks after 9/11 or the Northridge earthquake or even the Tsunami of 2004? My breathing is becoming short. I have to stop. By the way, Happy Thanksgiving. I am thankful for the hardworking spirit of the people of New Orleans and the Gulf Coast. This year I pray for patience and tenacity for all of us. Surprising the assembled reporters and local dignitaries, Bush, Cherthoff, and Rumsfeld left the press conference early in order to attend a meeting in Washington regarding progress on America’s manned mission to Mars. Last night's Nova and Frontline programs were excellent, with great additional material online that I plan to explore. They reminded my that New Orleanians (even moreso than Mississippi Gulf Coasters, who took horrifying damage) were failed more by governmental institutions than they were harmed by nature. We were promised Category Three protection by the Army Corps of Engineers, got hit by a Category Three storm, and were decimated. The case is as simple as that. One can go on and on about local corruption and incompetence--and I am ALL about running out the chuckleheads from 'round these parts--but the federal government did not deliver. What is borderline criminal now is the utter failure to deliver any meaningful assurances about the future. Why should we trust them now ("No, this time we really will deliver--and by next summer")? John Biguenet, an outstanding author and professor at Loyola University New Orleans, offers this sober and evenhanded assessment of the mood here and of the high emotional and moral costs of the federal government's current inaction. Something's missing in Washington. Dark, Sith-like forces are behind this. I can't believe it's simply incompetence. I still have faith that this will shake out for the best. As Lt. Gov. 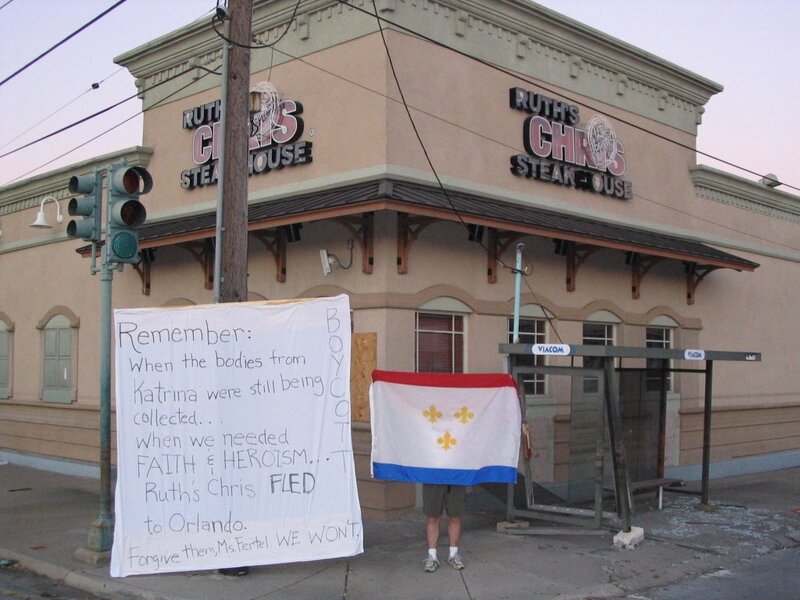 Mitch Landrieu said, Katrina has had the effect of revealing angels and demons, of showing the world who each person in our region really is. It is fleetingly unpleasant to look truth in the face, but it's ultimately healthy. We'll get there. New Orleans and the Gulf Coast will get some wanted attention from PBS's excellent Nova and Frontline series. The New York Times has a nice preview of both programs. Try not to throw things when Michael Brown's interview appears on the Frontline program. I welcome analysis from these programs. I also hope that they will revisit our situation with forward-looking programs on prospective solutions and progress as we work on our resurrection. On Tuesday, November 17, PBS will air back-to-back episodes of the science series "Nova" and the newsmagazine "Frontline" that search for explanations in the realms of science and politics. 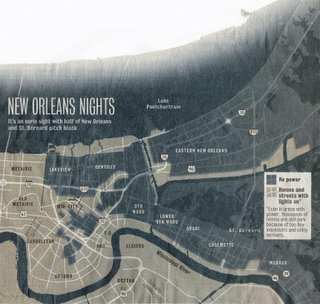 In "The Storm That Drowned a City," Nova uses computer graphics to illustrate Katrina's advance toward New Orleans and dissect the engineering faults in levees and floodwalls that led many parts of the city to become flooded in a toxic soup. Meanwhile, "Frontline" investigates the fragmented and ineffective response to the crisis, which left emergency personnel without the ability to communicate with each other for days. The show includes interviews with several key political figures, including what it says is the first with Michael Brown, the former FEMA director, since he resigned from that post. Fellow blogger and Saints fan Berto has written what may be the greatest blog post ever written on any topic. Or maybe it's just the best ever written about the Saints. In any case, if you desire a world class football team for our fair city, check out what Berto has to say. I (Dilly) and Berto have been known to wear world class golden jumpsuits to Saints home games. My friend Anita Mital forwarded to me an email that her mother, Gisela Mital, sent to her. Gisela lives in Toronto now and doesn't often tell stories about life in Germany during the war. Her hometown is Kassel in Hessen in Germany. It is where Volkswagens are now made. This is the best, most encouraging reading I've done in the Post-Katrina, Post-Manmade Flood Era in New Orleans. We are sending very good wishes to you and hope that you have recovered from your strenuous car ride from Little Rock. The dogs hopefully were good dogs and remembered the house and their playing space in the yard, and are happy to be with you again. The temperatures seem to be nice and comfortable, as I could see in the newspaper, and that should help getting back into the old routines, if you can overlook the mess the hurricanes have made in the city. In time the city will heal, and eventually will be more beautiful than it was before the storm. The same happened in my hometown in Germany, which was 90% destroyed on the 22nd of October in 1943. Your Uncle Wally was born that night (not surprising), and we other children waited out the immense bombing in our cellar. Those were some fireworks, I can tell you! Our city too was in a terrible mess and shambles. We had a bomb in our backyard, one in our rafters, and one phosphorous bomb (those ever-glowing and ready-to-burn ones) in the sidewalk right in front of our place. We kids had fun stepping on the sand that was piled on to them to make them less dangerous, and seeing the blue flames start eating our shoe soles. Only sand would quench the fire and save our precious footgear for walking. All the people who were bombed out were ordered into every house that was still standing. Our place was jug-a-lug-full of families who were ever so happy to have a good place to stay. Well, you know the feeling now, as you have experienced the same feelings. To make the story short, my city was born again with old and new buildings standing happily side by side. Pride--not only in the people but also in the houses themselves--seemed to grow. The city of New Orleans will also get back on its feet and will don an ever-so-pretty-garment to feel happy and impress everybody immensely. Stories of hard times and misery will get laced with the funny and moving moments. Sad and happy times and all will get woven into a good piece of cloth that will be admired by future generations to come. And you and your friends will have been part of it all --and can be proud of it! This is just a little remembering and an attempt to encourage you all when you see the destruction of your beloved city. There are always hope, hard work, and happy people, all of which will make out of a mess a many-faceted and worthwhile project and place again. Hoping this finds you happy and very well. The Times-Picayune took the extremely rare step of placing an editorial at the top-center of its front page today, Sunday, November 20, 2005. Some voices in Washington are arguing against us. We were foolish, they say. We settled in a place that is lower than the sea. We should have expected to drown. As if choosing to live in one of the nation's great cities amounted to a death wish. As if living in San Francisco or Miami or Boston is any more logical.
. . . The federal government decided long ago to try to tame the river and the swampy land spreading out from it. 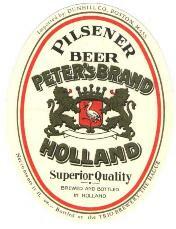 The country needed this waterlogged land of ours to prosper, so that the nation could prosper even more. Some people in Washington don't seem to remember that. They act as if we are a burden. They act as if we wore our skirts too short and invited trouble. I think almost everyone on the Gulf Coast has been helped and moved by the generosity of our fellow citizens on a personal level. However, something is missing at the governmental level. At this point, I still can't tell if it is incompetence or malevolence. My suspicion is that it is a kind of lazy indifference that metastasizes into malevolence AND incompetence. I don't think any of us in New Orleans want blind charity. We want smart, effective help at a basic level. When it is determined that the science and engineering are available to repair our wetlands and levees, we deserve a chance to thrive. Human activity made most of this mess, and I have a strong suspicion that human ingenuity can fix it. There is on the globe one single spot, the possessor of which is our natural and habitual enemy. It is New Orleans, through which the produce of three-eighths of our territory must pass to market, and from its fertility it will ere long yield more than half of our whole produce and contain more than half our inhabitants. The kind people at Marketplace, public radio's business program, broadcast my commentary on a failure of our leaders' vocabulary about the Gulf Coast's recovery. Special thanks to my friend Deborah Clark for helping me get a little word out about the Gulf Coast. Very special thanks to my friends Armand St. Martin and Patty Lee for recording my bit in their recently flooded and now under-repair home. Given New Orleanians' urgent interest in an excellent flood protection system, we should be careful about which fermented barley beverages we choose. 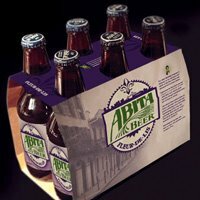 I endorse Abita Fleur-de-lis Restoration Ale ($1 for every 6-pack sold goes to a hurricane relief fund) and Peter's Brand (can't find a link). I discovered the latter yesterday for the first time at the Sav-a-Center on Tchoupitoulas. At $4.99 per six, it's a proletarian Heineken's, which is to say that it's quite possibly better than the green-bottle brand made famous by that looter guy (and who could blame him?). At 7:30 p.m. CST, on Thursday, November 17, 2005, FEMA called my land line telephone. They wanted to know if I need a trailer to live in. Now, I'm not a very smart guy. However, my thinking is this: Many phones in metro New Orleans are not working. Or, even if they are working, no one is there yet. If I'm answering my home phone on a cold night in New Orleans, there is an almost 100 percent likelihood that I do not need a trailer to live in. I'M IN MY HOUSE! I politely told the very professional-sounding woman that I was in my house (obviously? ), and I urged her to use the trailers for people who really need them because we desperately need New Orleanians back in New Orleans. I can't wait until the successful resurrection of New Orleans bubbles over into a FEMA that works well for the rest of the nation. When Lafcadio Hearn moved to New Orleans in the 1870s, he wrote to a friend back in Cincinnati: "Times are not good here. The city is crumbling into ashes. It has been buried under a lava flood of taxes and frauds and maladministrations so that it has become only a study for archaeologists. Its condition is so bad that when I write about it, as I intend to do soon, nobody will believe I am telling the truth. But it is better to live here in sackcloth and ashes, than to own the whole state of Ohio." A world class city like New Orleans deserves well-kept public spaces. Unfortunately, Katrina and her manmade flood in the city have caused a neglect of some publicly maintained grassy areas. The neutral grounds (medians) in Uptown New Orleans have been cut in some areas by city crews and/or guardsmen, but some neutral grounds are not being maintained. Citizen action corrects this easily. 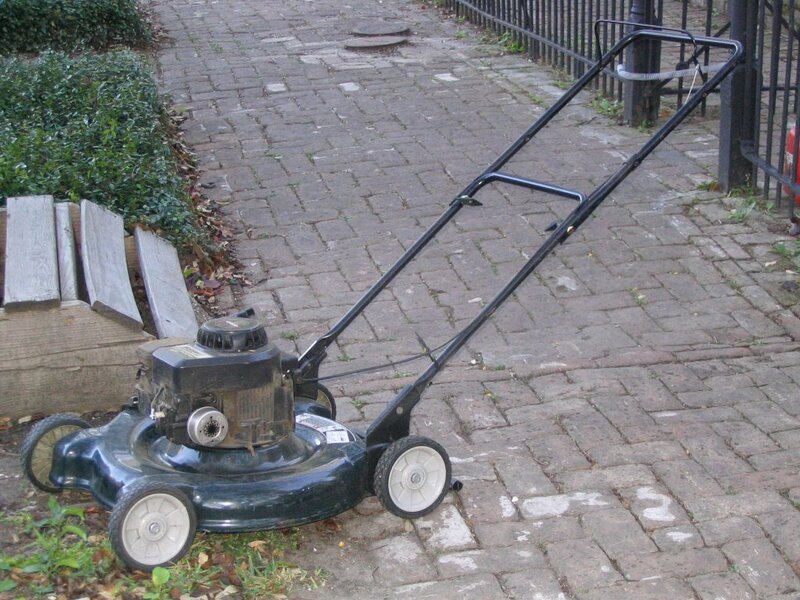 My property is grassless, but I miss cutting the grass. The Metairie Lowe's had a great price on a solid lawnmower, so I purchased one and have begun working with fellow blogger Dillyberto to improve Uptown public spaces. American culture has truly triumphed by pitting the individual against an overarching economic/political structure with virtually no strong intermediary institutions. Katrina and the manmade flood in New Orleans (and ensuing chaos) have revealed that small-scale cooperation among people has withered away. Local, state, and federal governments forced us to stay away (even during the early rescue operations when able-bodied people could've helped) for weeks at a time. There are virtually no neighborhood groups functioning in any meaningful way (other than those St. Tammany "neighborhood" groups that voted to keep evacuation trailers out of their gated communities). How to combat this? Inspire others by cutting public grass, cleaning up, moving old fridges to public spaces where they can be hauled away, etc. More soon on this vital part of how New Orleans will be a beacon to the world for New Neighborhoodism (e.g. keeping people working together in a neighborhood, instead of locking people out). Before Katrina, The Times-Picayune, our local newspaper, was a major part of New Orleans, with a larger market share than any other newspaper in the country. Few people were very happy with it, however. At times it seemed to combine the worst of both worlds: the cynicism of modern journalism and the parochialism ascribed to the South. This will look like a told-you-so letter, and perhaps it is, in effect. However, my point in writing it is to compliment you on your outstanding coverage of Katrina, Rita, and the ongoing problems we all face as we work to resurrect our region. The text below is a letter I sent you almost exactly one year ago. At the time, you were running, on a fairly consistent basis, outrageously silly articles on your front page, even as our nation was at war and our region was at risk. One year later, I am overwhelmingly proud of my hometown newspaper for the first time. When I picked up my paper today and saw the beginning of your three-part series on world-class flood protection in Holland and elsewhere, I got tears in my eyes. Your photographers, writers, and editors deserve the highest praise for becoming the best kind of newspaper a city can ask for. You helped keep me going when I was in exile in Baton Rouge. Thank you, and keep up the good work. As a New Orleans resident, I want to thank you for your front-page, above-the-fold story about the Northshore Naked Guy (Nov. 9). I am very pleased that you made me turn to page A-3 to learn how global warning may be melting Arctic ice and thereby threatening local wetlands restoration efforts. I am grateful that I had to turn to page A-9 to learn of the unconstitutional treatment of prisoners at Guantanamo Bay, Cuba. Armed with a properly prioritized sense of the key issues of the day, I feel fully prepared to engage my fellow citizens in dialogue about our nation and world. Thank you. U.S. Sen. Lincoln Chafee, a Republican from Rhode Island, wants to give serious consideration to an extensive outer-ring of flood protection for New Orleans that would reduce reliance on the kinds of levees that failed us with Katrina. Chafee, a member of a levee oversight committee who toured hurricane-devastated parts of the city Monday, said, "That may be the route to go," while noting that an outer flood protection system shielding the New Orleans area from hurricane storm surges could cost $14 million for each mile of structure. "That's expensive," he said. "But then there is an enormous amount of revenue generated from the success of New Orleans. It's a city that generates billions and billions in revenue. That's a factor." It is inspiring to see and hear about companies who are showing faith in the New Orleans area by returning and vowing to build better and smarter than ever. Imagine what will be possible when federal and state officials unequivocally commit to building a revolutionary system of levee protection, floodgates and wetlands protection. New Orleans will be a true model for the world. We hit a bump several weeks ago, however. The internationally known Ruth's Chris Steakhouse restaurant chain was founded in New Orleans by Ms. Ruth Fertel, who passed away a few years ago. Before her death, she sold her company, which began with a single steakhouse, to a corporation. A phone conversation with an executive at Ruth's Chris new HQ in Orlando was telling. His speech was interlaced with chuckles and "sincerity" as he refused my polite request to move back to our area. He also indicated that their steakhouse on Orleans and Broad in New Orleans--which has been a real power center for politicians and corporate chieftains in the city--will not be reopened. I will be dining on steak frequently at other establishments in the future. I encourage you to frequent other steakhouses AND let Ruth's Chris know why you are not dining there. I snapped the above picture while passing the Orleans & Broad location of Ruth's Chris. It seems others are not happy about this decision either. Ruth's Chris fled to Orlando. Forgive them, Ms. Fertel. We won't. ''My mother would never have done that,'' he said to cheers from the audience, ''and she would have reopened our original Broad Street restaurant, too.'' (NY Times, November 2, 2005). Ruth's Chris: You still have a chance. Come back to where you belong, and be part of a dynamic resurrection. Until you do, I will be bringing my business to companies that are forward-looking. You don't qualify right now. The dark areas on the map STILL do not have electricity. Much of Orleans Parish and almost all of St. Bernard Parish lack power, and brave people are camping out in their own homes doing work and waiting for electricity. In some cases, it is not safe yet to re-energize lines in their neighborhoods or homes. In other cases, the only hold-up is an inspection from overtaxed parish officials. Our brothers and sisters outside New Orleans need to know that we were forcibly kept from our homes for a minimum of three weeks; most people who want to come back are only now doing so. Residents of the Lower Ninth Ward still cannot return to their homes in a permanent way. This has delayed the beginning of our comeback. That delay has caused a tremendous amount of anguish here, above and beyond the feeling of loss related to loved ones who are gone or property that has been destroyed or compromised. Even those of us who have returned to dry homes are waiting for word that our city will receive world-class levee protection and wetlands restoration. Until we get this guarantee, it will be impossible to guarantee the bright future that is within our grasp. Thanks to Schroeder for pointing me to a nice pdf of this map. 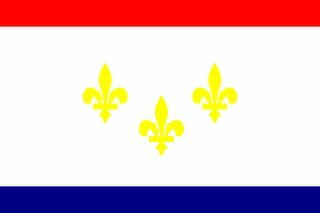 The flag of New Orleans is unfamiliar to many. I see it flying more than ever before these days.